Sound Transit 3’s investment in parking is likely critical to some voters’ support to expand light rail deep into the suburbs — north to Everett, east to Issaquah and Redmond and south to Tacoma. But some say it’s too costly and a waste of land. Sleep in, and you’ll be too late to find parking in the six-story garage at the Federal Way Transit Center. All 1,190 spaces will be taken. Same goes for hundreds of spots at Kingsgate in Kirkland, south Renton near the S curves, or just about any major express-bus or commuter-train station. With that appetite in mind, the Sound Transit 3 ballot measure proposes an increase of 8,560 park-and-ride stalls, as stations open between 2024 and 2041. Property tax: $25 a year per $100,000 of assessed value. Sales tax: increase of 50 cents per $100 purchase. Car-tab tax: a yearly increase of $80 per $10,000 vehicle value. A median household would pay $326 next year per household in new tax (or $169 per adult), plus $303 in existing Sound Transit taxes that voters passed in 1996 and 2008. Try The Seattle Times tax calculator to determine your own tax increase. 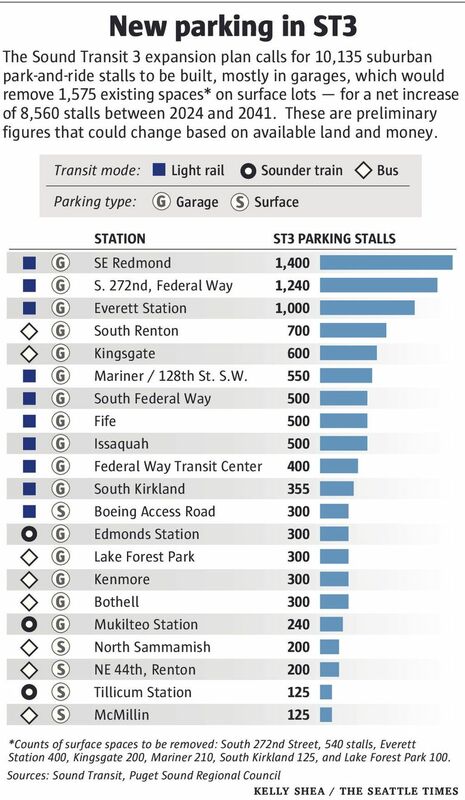 ST3’s investment in parking is likely critical to some voters’ support to expand light rail deep into the suburbs — north to Everett, east to Issaquah and Redmond, and south to Tacoma. The $54 billion, 25-year-package also includes increased Sounder commuter-train capacity, and bus-rapid transit lines north and east of Lake Washington. But for some green and urbanist thinkers, the plan wastes money and land to subsidize car storage. Spend less on parking, they suggest, and more on frequent service, affordable housing, or better walk, bike and bus access to stations. The Sierra Club, for instance, supports ST3 but expects to raise questions again about parking after the election, said Tim Gould, an executive-committee member. The measure not only proposes parking at train stations but offers 900 spaces along Highway 522 and 1,200 along I-405, to support bus-rapid transit. Some communities wanted more. Renton asked for 2,000 stalls for its bus hub near Highway 167 but managed to win only 700 in the plan. Hundreds might be added in the Green River Valley if money is left over after the agency lengthens its Sounder trains and platforms, and maybe buys more track time from BNSF Railway, to add midday transit service. Rogoff said he even hopes to build some garages early, to serve current bus riders during the years before light rail arrives. Ballots in the all-mail election, where the transit plan is called Proposition 1, must be postmarked by Nov. 8. Last year an average 19,488 cars occupied park-and-ride facilities each weekday in Snohomish, King and Pierce counties, Puget Sound Regional Council data show. At least 51 sites, especially those next to express bus or train stations, were at least 95 percent full. Park-and-ride lots began in suburban Philadelphia in 1928 and have proliferated to more than 850,000 stalls nationally, which continue to grow. But the taxpayer subsidies are enormous. ST3’s preliminary park-and-ride figure of $698 million (in current dollars), for 10,135 new stalls, looks like an average $69,000 a space, of which one-fourth goes for buying property. Of the new stalls, 1,575 exist now on lots but would be shifted to garages. The real costs ought to be less, because the early ST3 numbers include a 50 percent financial cushion, said spokesman Geoff Patrick. This year, the 1,092 spaces at the just-opened Angle Lake Station garage averaged $35,000 each, including land, engineering and construction. Costs of $30,000 to $50,000 per stall aren’t unusual in North America, plus land and inflation, said consultant Todd Litman of the Victoria Transport Policy Institute. 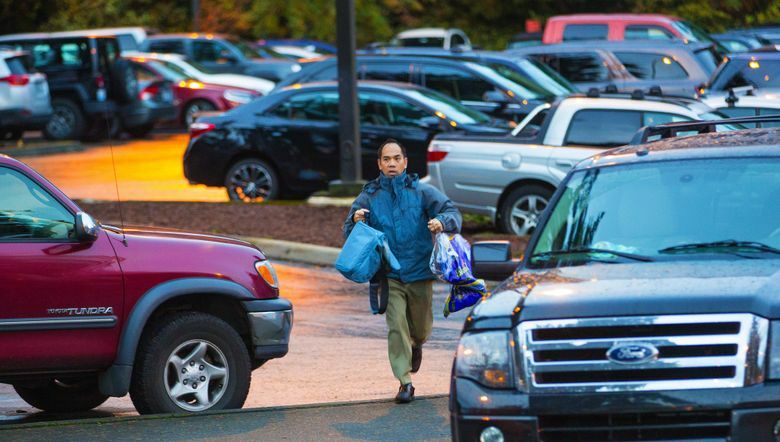 “Of all the ways to help people get from home to work, providing a fully subsidized park-and-ride lot is one of the most inefficient,” he said. In making the ST3 plan, transit-board members didn’t debate how many dollars should go to regional parking. Instead, they anticipated how many stalls would serve future needs in each outlying location, said Claudia Balducci of Bellevue, a member of the transit board and the King County Metropolitan Council. “There’s a balance that we tried to strike,” she said. An additional $100 million is earmarked to improve station access for people to walk, bus, bike or be dropped off at the stations. 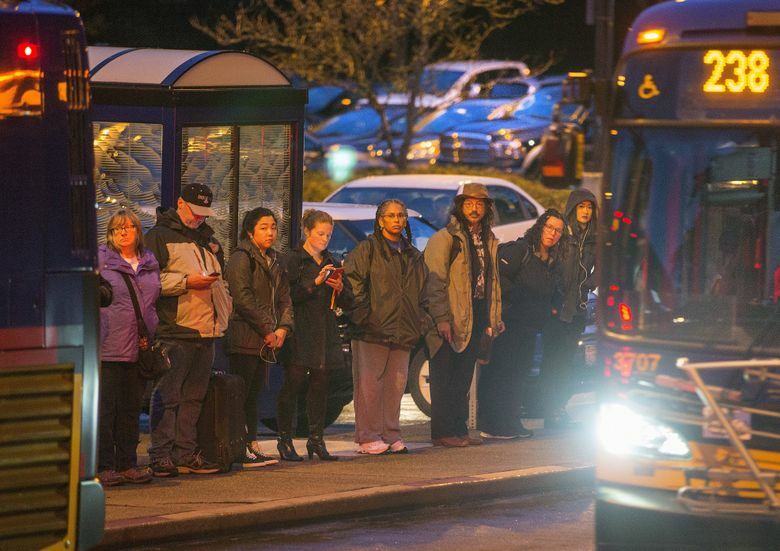 Wednesday morning at the Federal Way Transit Center, the last rain-covered parking spaces on the garage roof were filling at 7 a.m.
Like penguins on the march, hundreds stood in line to board the frequent ST Express 577 and other buses. Imelda Aguilar had just parked her car and was waiting for a bus to her job at the downtown Seattle YWCA. If parking were more plentiful, Aguilar figures, she could sleep an extra 30 to 45 minutes and catch an 8 a.m. bus. When she recently arrived late, she drove around the garage for an hour until a space serendipitously opened. Fellow commuter Jamal Williams said he sometimes lingers near the garage’s ground floor, where the odds are best that a returning night-shift worker pulls out. Stressed-out motorists zip through the structure, he said. “I do 15 mph, and they’re on me like a NASCAR racer,” Williams said. Others default to a distant lot near The Commons mall, or choose to keep driving. Sound Transit 3 would add 400 stalls here and 700 two miles north at South 272nd Street, to open along with light-rail stations in 2024. An additional 1,000 total stalls at South Federal Way and Fife would support a Tacoma extension by 2030. To neglect parking would spell political doom. An online survey by Sound Transit found that more parking at train stations was the top priority for people answering in South King County. “They’re helping pay for this. You need to give them a way to get on this. Doing otherwise is stupid,” said transit-board member Pete von Reichbauer, a Metropolitan King County Council member from Federal Way, for whom a road to the transit center is named. The city insisted on park-and-rides near the freeway, disregarding advice from the Sierra Club, the anti-sprawl group Futurewise and transit-board members from Seattle, to build tracks over Pacific Highway South and pursue transit-oriented dense development. Some communities wish to have it all. Everett Station would add 1,000 parking stalls with its light-rail train by 2035, but the garages would be combined or shared with housing, restaurants and shops, said Councilmember Paul Roberts, also on the transit board. Transit spaces at Northgate and Kent stations are used evenings and weekends by shoppers and moviegoers. Tukwila International Boulevard Station attracts 3,000 daily boardings from a triple supply: the 650-stall parking lot, apartment clusters a short walk downhill and people stepping off RapidRide buses. The neighborhood’s aging housing and strip malls evoke an urban planner’s nightmare, but it outdraws any South Seattle station, while reaching lower-income people and racial minorities. Steven Polzin, a mobility expert from the University of South Florida, said agencies that spend heavily on fixed transit understandably use parking to serve a broader geographic area and appeal to voters. “One could certainly question the fundamental logic of serving low-density areas to begin with …,” Polzin said. Sound Transit’s parking spaces ought to be priced to control demand, the Sierra Club’s Gould said. And where parking is added, it should be in lots rather than permanent garages, so that the land can be redeveloped as a community grows, he said. “If people choose to live out in a remote area, they ought not to expect a comfortable commute to downtown Seattle, Tacoma or Everett,” he said. The new Expo Line in Los Angeles added only 544 stalls in seven westside stations, at a $2 daily fee, despite fears of shortages — but early surveys found only one-sixth of customers drove alone to catch a train. Sound Transit’s stalls are free, but the agency has discussed charging in the future. This fall, at some lots, carpools can reserve a space for a token $5 monthly fee — even after 7 a.m. By favoring carpools, the agency hopes to serve more people per facility. ST3 opponent Kevin Wallace suggests that huge park-and-ride facilities for buses and cars can be a cheaper substitute for much of the 112-mile light-rail network Sound Transit envisions. “If you just had a much larger park-and-ride for Lynn­wood, you wouldn’t need to spend $5.8 billion and almost 20 years for light rail to Everett,” argued Wallace, a Bellevue City Council member. Actually, the fully occupied Lynnwood Station is scheduled to grow from 1,368 stalls to 1,900 stalls by the time trains arrive in 2023, regardless of Proposition 1. At a certain point, planners think it’s futile to beckon thousands of drivers who jockey to enter a garage. Community Transit and city staff say they’re striving for 80 percent of train passengers to reach Lynnwood Station on a bus or by walking.